Cardi B is living her best life and she gave a great performance at the 2018 American Music on Tuesday(October 9th) at the Microsoft Theater in LA. 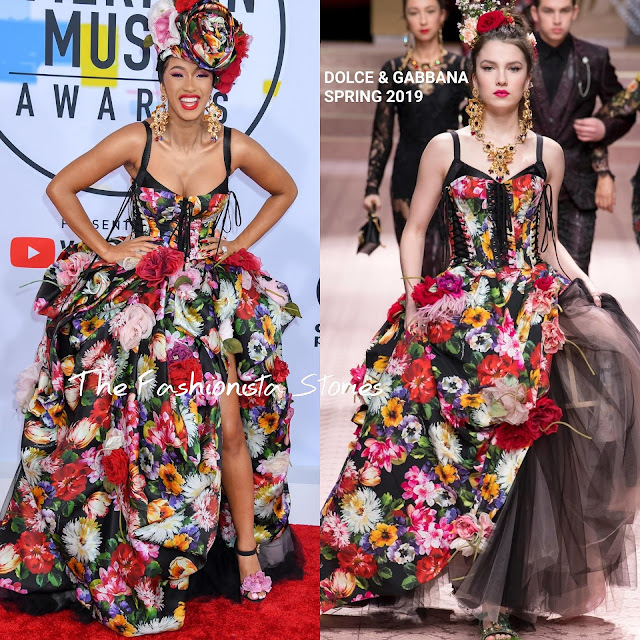 Seeing as she was front row at the show, it is no surprise that CARDI is wearing DOLCE & GABBANA SPRING 2019. Her floral embroidered & tulle layered corset gown was accessorized with a matching head piece, the same gold earrings from the runway and flower panel sandals. This look is bold, vibrant, fun and a little dramatic which speaks to Cardi's personality. This look was perfect for her. Are you feeling Cardi's floral look?